A chance to meet one of New Zealand’s top recruiters? Yes please! 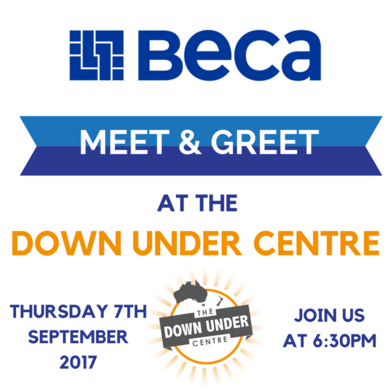 The Down Under Centre is hosting a meet and greet event with BECA on Thursday 7th September at 6:30pm. This is a chance for you to learn more about living in New Zealand and what BECA can do to help. Beca is a leading Asia Pacific multidisciplinary consultancy and has operated in over 70 countries. They are a team that understands the power of working together to bring resourceful, smart solutions from their collective experience and insights. While their experience has been 98 years in the making, it is the fresh talent they’re nurturing, the innovative thinking they’re developing and the connections that they’re forging that get us most excited for the future. BECA have over 95 years’ experience in successful client relationships, technical excellence & delivering award-winning solutions. With around 3000 employees, their employee owned organisation has the diversity of experience and expertise to tackle major engagements. Civil/Infrastructure Engineers Structural Engineers Mechanical Engineers Electrical Engineers Transportation Engineers Defence Specialists and Engineers Project ManagersIf you’re interested and would like to fill any of the positions BECA have available, apply today on our jobs page! Along with a range of our expert partners, BECA also present on our monthly migration webinars. Why not register for our next New Zealand migration webinar which is on Tuesday 15th August at 8pm! Speak to BECA about new job opportunities and what the working lifestyle is like in New Zealand. Feel free to ask any questions you may have about the migration process! Find out more about our webinars here. REGISTER HERE FOR OUR NEXT MIGRATION WEBINAR!